Angelique Adams was a runaway coming home from Las Vegas. Only she never made it and her last text message said she had been trying to escape some "cult wackos"! Lost in the Lights presents a full description and history of the Keepers of the Primal Song, and 'Invisible Sun', a full-length investigative scenario and thoroughly researched background for call of Cthulhu ...Right Now! Plus add-on plot seeds, suggested viewing & listening, and conversion notes for the Delta Green setting. And Elvises. Lots and lots of Elvises. Prepare to have your soul set on fire... figuratively and literally. Casino security, cinematic capers, tech-savvy villains, underground night clubs, faded pop stars and celebrity cameos (real and not-so-real) all add up to a long, strange trip... Beyond. 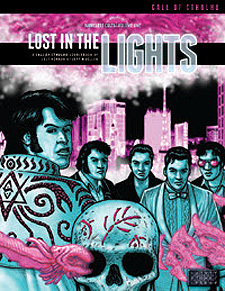 Lost in the Lights is the first volume of 'Neue Unaussprechliche Kulte', a series detailing modern day cults that are ready to run for any Keeper of Arcane Lore.